It is 1940 and Annie de Leeuw and her family listen, with increasing concern, to the news about what the German Army is doing. Annie’s father goes so far as to suggest that they should leave Holland and go to America where they will be safe. He has heard stories about what the Germans do to the Jews who live in the countries that they occupy, and he fears for the safety of his family. His frail wife refuses to leave however. She does not see the Germans are a real threat. Then in May the German’s invade Holland. At first things don’t change much but over time Jews are permitted to do less and less. They are forced to wear a yellow star on their clothes, they cannot go to school, they cannot conduct business, they cannot go to theatres and parks. When the Germans start taking Jews away to work in labor and concentration camps, Annie’s father decides that the family needs to go into hiding. He is the first one to leave home. Annie and her older sister Sini leave soon after. Rachel, the eldest, cares for their mother who is in hospital for a while and then she too has to begin a hidden life. Sini and Annie end up living with the Oosterveld family on a remote farm in the town of Usselo. The farmer, Johan, does not mind harboring the girls. Nor does his elderly mother, Opoe. But Johan’s wife Dientje is fearful. She is afraid that the girls will be discovered and if they are, the girls and the Oosterveld’s will pay a terrible price. Johan builds a hiding place for the girls and he and his wife and mother all do what they can to make the girls’ life as comfortable as possible. It is not easy for the girls have to remain hidden at all times. They cannot even look out the window, let alone go outside. The lack of exercise makes Annie’s legs weak and she walks strangely. When she sees this Sini, being the older sister, makes Annie walk around their little room every day. Time drags on with few changes. Annie longs to be able to go outside but Johan does not dare allow it. Then, as if things are not bad enough, the Germans decide to use the Oosterveld house as their headquarters. Now the Germans are downstairs all day long. Annie and Sini wonder how much longer the war will last and if they will be able to get through the remaining time without being discovered. This remarkable award winning title is based on the true story of the author’s own wartime experiences in Holland. Like Annie, Johanna Reiss had to go into hiding with her sister, and like the de Leeuw girls, the author had to spend almost three years in her hiding place. 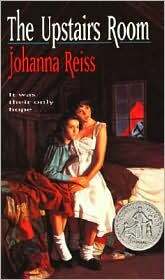 Johanna Reiss gives her readers a gripping and very moving picture of what it was like to be a child in hiding during World War II. She captures the simple joys and woes that the two girls experience, and she shows her readers what a frightening and difficult time the occupation of Holland was for the Dutch people. Many brave people hid Jews from the Nazi’s and not a few of them lost their lives when they were caught. This book is a splendid tribute to both the people who were hidden, and to the people who did the hiding.